foodbank4whitby provides an emergency food lifeline for neighbours in need, in partnership with professional agencies who get alongside and help tackle the underlying problems . . . The food bank is normally open on Monday and Friday afternoons 2pm – 4pm. The primary route to access the food bank is through one of our referral partners. foodbank4whitby operates primarily through referrals by its partner agencies like CAB, the Children’s Centre and Yorkshire Coast Homes. They are listed on the Partner page. In an emergency, we do accept self-referrals for a limited supply of food prior to attending a Referrer. The food bank is open to callers on Monday and Friday afternoons 2pm – 4pm. The food bank is accessed via the rear of Whitby Evangelical Church (entrance far end of Poplar Street). The Second Anniversary presentation has been uploaded. The January 2016 newsletter has been uploaded. Town centre Co-op hosts a bin! There is now a collection point at Whitby Co-op. Our thanks to the staff. The December newsletter has been uploaded. 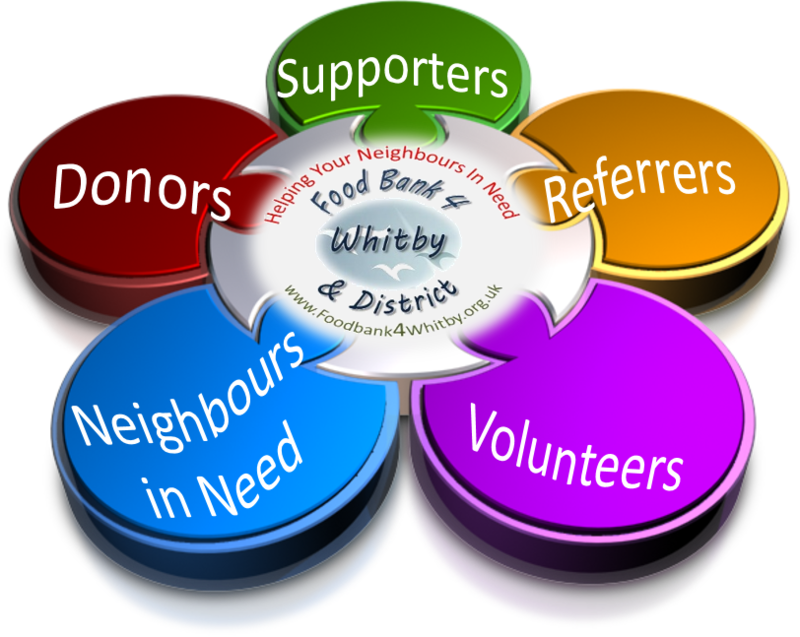 After 9 months operating under the charity umbrella of Whitby Area Development Trust, foodbank4whitby is now an independent charity. See the December/January Newsletter. People in need have benefitted from the generosity of customers of Sainsbury to the tune of over 800 bags of food and other essentials. Thank you customers and thank you Sainsbury’s for welcoming the bin. We thank corporate donors of goods and services helping to strengthen our community. In the first year, Whitby Seafoods, Fletcher & Woodhouse flooring, Yorkshire Coast Homes, Vinyl Signs Whitby, Foil & Form Supplies and Whitby Evangelical Church for the use of premises for f4w.